Growing is all about the unexpected and usually the unexpected is a bad thing. The other day my neighbor told me that my ducks were eating my lettuce and I thought “oh, they’re probably eating that old bed of salad mix…what can they really do?” Well, I found out when I went out there today to find two little ducks had eaten about half of the head lettuce out there and I caught them red handed doing it! Now I’ve read that ducks are good to have around a place like ours because they are supposed to eat potato bugs, but I’ve yet to see any truth to that. Instead, they are more like farm saboteurs than f’arm helpers. 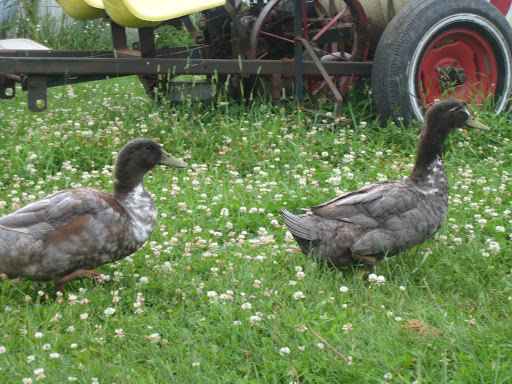 Honestly, if you or someone you know would like to adopt these ducks, let me know soon. Otherwise their lives will be cut pretty short. (note: you probably didn’t receive as much as a lb, so adjust accordingly). Heat a large, 12-inch saute pan over medium-high heat. Add the vegetable oil to the pan, and when hot, add the bacon in the pan and cook, stirring often, until the bacon is well browned, 7 to 8 minutes. Add the onions to the pan and cook, stirring often, until softened, 3 to 4 minutes. Add the garlic and cook for 30 seconds. Add the greens to the pan and cook, stirring frequently, for about 1 minute. Add the water and salt and bring the liquid to a boil. Cover the pan and reduce the heat to medium-low. Cook until the greens are tender, about 20 minutes. Remove the lid, and raise the heat to medium-high, and continue to cook until most of the liquid has reduced, about 5 minutes. Taste and re-season the greens if necessary. Welcome to the 2010 Lida Farm CSA season! This is our 5th season operating a CSA in the Pelican Rapids area, so we should know what we’re doing at this point! If you’ve come to this blog looking for news from the farm this spring and past winter, you’ve been sadly disappointed since I write little in the off season. But now that produce is coming in expect an entry every week about the going-ons at the farm, what’s in season and in the CSA box, and my general musings about small farms and the like. We also highlight a recipe each week which features a veggie in season. Overall spring has been good as we get ourselves organized for summer. Spring is a time we ramp up on projects we just can’t pull off in July or August when we get on a treadmill of plant, harvest, wash and repeat. For example, This year we offered a chicken share where people pre-arranged whole broilers which we’ll deliver late summer or early fall. Now that we’ve promised all these people some 250 chickens, we actually need to raise them. Part of that is giving them a place to live, so my carpenter father-in-law Don and I have been diligently building a lean-to off the side of our woodshed (mainly Don…he’s the professional. I just haul tools and stuff for him). It still needs some tin for the roof, but the hard part is done we hope. As you can see from the picture, the lean-to juts into our pasture, so, when the chicks arrive they will have easy and free access to grass and pasture. Mix all ingredients well. Store in refrigerator.